Researchers at the University of Pennsylvania have found a way to modify the behavior of carpenter ants using epigenetics—the science of how a gene gets turned into a physical body part or a character trait. They reported their findings last week in the journal Science. Are you ready to be a Beastmaster? Camponotus floridanus — better known as Florida carpenter ants — have a number of castes. The two most common are the soldier caste (a massive brawny ant with a big head and a fearsome set of mandibles) and the worker ant (a small, brainy ant). The worker caste is the kind of ant that would star in an animated movie. It’s also the kind of ant that could ruin your picnic because it forages for food and, when it finds a bounty, recruits all the other worker ants to bring the food home. 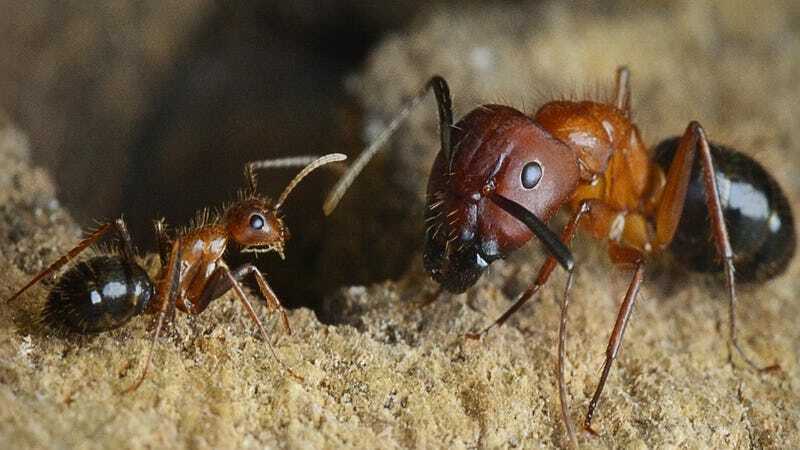 If you looked only at their DNA sequence, you’d expect cells from brawny and brainy ants to be identical. What makes them different is their epigenetics. The same DNA sequence gets expressed different ways to make ants that look and behave differently. The UPenn study looked at the acetyl groups of the ants. Acetyl groups are simply an oxygen atom linked to a carbon atom and three hydrogen atoms. They attach to histones—proteins in the cell around which DNA coils. The tighter the DNA coils, the less certain genes can be expressed. Add acetyl groups to the histone, and the DNA uncoils, unlocking certain genes. Both the brainy and the brawny ants got a dose of chemical that inhibits the removal of acetyl groups. The brainy ants immediately stepped up their foraging activities. When fed a chemical that inhibits adding of acetyl groups, the brainy ants slowed down their foraging behavior. Essentially, these drugs installed a dimmer switch in the ants, allowing us to dial up or dial down their foraging behavior. The real revelation was the behavior of the brawny ants. They didn’t respond to the drug in their food. Mature ants didn’t even respond to the drug being injected into their brains. However, the researchers eventually found “an epigenetic window of vulnerability,” during which injection of the acetyl removal inhibitor made them start behaving like workers. The drug was not permanent. It was out of their system within ten days, but they kept up their foraging brainy behavior right until the end of the study. So, could we one day use these drugs to alter human behavior? “That would be a leap,” team leader Shelley Berger told Gizmodo. When comparing ants to humans in this study, we shouldn’t think of ants as individual creatures but as different parts of the same creature. The cells in our bodies have the same DNA, but they look different and perform different functions. Which isn’t to say that we don’t use epigenetic modification in humans. Histone deacetylase inhibitors, or HDAC inhibitos, are already used to treat conditions like depression, epilepsy, as well as cancer and some parasites. But they haven’t been shown to have huge, permanent effects of behavior the way the inhibitors did on the ants. Perhaps humans have their own “epigenetic window of vulnerability.” Berger thinks its possible. She listed aggression and antisocial tendencies as possible behaviors one might be able to alter in this way. Mostly she hopes that in some far future, humans might be able to use epigenetics to make themselves smarter — to turn all their brawny ants to brainy ants. Could we be controlled through food, like the brainy ants who were turned into hyper-foragers or indifferent foragers after being administered drugs? According to Berger, ants have a circulatory system that looks nothing like a human’s. They have “hemolymph”—which coats their internal surfaces instead of circulating. For humans, the drug would have to get from the stomach into the blood and cross the blood-brain barrier. She’s not sure it can do that effectively in humans. So who knows? Maybe one day our pets will be friendlier, our horses will be eager to plow the fields, and pigs will cure and fry themselves. I, for one, welcome our new insect overlords’ overlords.